In her room in the rehabilitation center where she’s lived since late summer 2006, Margaret (Maggie) Worthen ’06 is answering an interviewer’s questions as best she can. Maggie Worthen ’06 with her mother, Nancy. “Do you still have pain sometimes?” Maggie moves her left eye down, indicating the affirmative. “Do you have fond memories of Smith?” Maggie instantly shifts her eye downward for a strong “yes.” Her answer is echoed in the photos of Smith friends that surround her, along with the carefully folded origami cranes, and a handmade quilt with messages from friends filling every square. She may be in a rehabilitation center, but her room has the familiar feeling of her Smith College house. Then, surprising everyone in the room, Maggie gives voice to her next answer. “Do you consider yourself a fighter?” She wriggles a bit in her chair as she blurts out a loud and unmistakable “yeeeeeeees.” For that moment—more than four years after a devastating stroke robbed her of movement, speech, and very nearly her life—Maggie Worthen is very much in control of her speech, and leaves no doubt that she’s fighting her way back. In May 10, 2006, Maggie was in her third-floor room in Duckett House, hard at work on her last paper and packing up her belongings. Commencement was days away, to be followed by a week at her family’s beach house in Rhode Island with her best friend, Katie Brown ’06. After that, she planned to start a job at an animal shelter, the first step toward her dream of becoming a veterinarian. That morning, though, her housemates reported hearing strange sounds from her room, recalled Arianne Arbel ’08. Some wondered if Maggie, the animal lover, had hidden a dog in her room. Several hours later, when the noise continued and included gurgling, Arbel and others used a mirror under the door to see what might be going on; all they could see was hair. Concerned, they called campus public safety. Maggie was found lying on the floor. An ambulance took her to Cooley Dickinson Hospital, which then transferred her to the University of Massachusetts Medical Center in Worcester, where she remained deep in a coma. Her diagnosis: a blood clot to the brain stem, which deprived her brain of oxygen until surgery was performed to break up the clot. On May 21, Margaret Worthen’s name was read at Commencement. She struggled with the decision. “I just couldn’t do it,” says Nancy, who has been Maggie’s legal guardian since her divorce seventeen years ago. “I wondered what she would want, and then I found Margaret’s application for veterinary school where she wrote that she didn’t think animals should be euthanized until every other means of care was tried. Well, here I am, her mother, she’s my daughter—a person—I had to try everything for her. It’s like she was speaking to me through that paper. I felt it was really quite clear what she would want.” Maggie’s father, Paul Worthen, who visits her weekly, too, stood with Nancy on this decision. Maggie’s situation dramatically changed in February 2008. That’s when she became part of a study by doctors from Columbia and Cornell that would prove she was not in a persistent vegetative state but was at least partially conscious. During tests with a functional MRI (fMRI), doctors asked Maggie questions and gauged her responses. “They recorded my voice and played it to her, then played it garbled, then played a different voice, and Margaret could somehow distinguish my voice and understand the message—she could determine correctly when I was speaking, and they could see that on the fMRI,” says Nancy. The conclusion from the study was that Maggie was at least minimally conscious, with the possibility that she is “locked-in”—meaning that she is fully conscious but without a way of expressing it. “I knew she was there,” Nancy says. “I knew my daughter and I felt all along that she was communicating with me in some way.” The confirmation that Maggie is in there changed everything for both mother and daughter. Most importantly, it gave a mother a chance to dream again. “I’m the most optimistic when Margaret is the most communicative—and these days she does seem more alert and involved in the conversations, listening, and sometimes it seems as if she is responding to a conversation,” says Worthen, adding that Maggie still has days when she does not communicate. Worthen dreams of her daughter one day regaining the ability to use her voice to answer questions—and to move her mouth so she can eat again, rather than relying on a feeding tube. Unlike other strokes, where the left side of the brain can compensate for damage to the right side, Maggie’s stroke affected the brain stem, which is a singular unit with no complementary part to aid with damaged functionality. Worthen’s hope is that other brain cells can grow and possibly take over various functions. For now, what she wants everyone to know is that Maggie is, in many ways, the spirited woman she once was—that the Maggie before is still here—just in another form. She still has goals, but they’re different now, seemingly simpler, perhaps, to outside eyes, but also far greater. She can’t quite speak (although she does make noises), but she can understand what is said and she can communicate somewhat. The stroke affected the part of the brain that controls speech and movement; doctors discovered, though, that if they open her left eye, she can answer questions by moving her glance down for yes and up for no, even if only for a short time before she tires. Days before she was interviewed, Nancy and a speech therapist prepared Maggie by going over the questions with her ahead of time. Hold one eye open a half inch. She may need to be reminded to look down for yes, up for no. Even if she is not responsive, she can hear you. Ask speech therapist for suggestions. Figuring out what Maggie knows should become easier with the special computer —MY TOBII—that she has had since late summer. Last year, Nancy raised the $4,000 needed for insurance-mandated computer trials in one of her many fundraisers to help cover the costs of Maggie’s treatment. Since the trials proved successful, MassHealth picked up the $15,000 tab to purchase the computer for Maggie. The laptop, which is anchored to Maggie’s chair, reads her eye’s response, but also speaks the words Maggie herself cannot yet say. This small machine has become the nexus of a mother’s hopes and dreams for her daughter. “I’d like to see her be able to use it to go on her Facebook page or to read books on it. 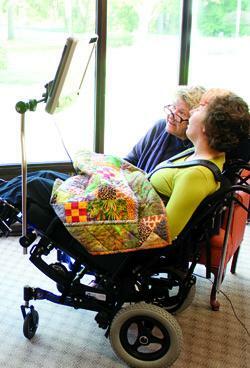 There are so many possibilities,” Nancy said. Already, Maggie is using it to play games, handily beating the computer at tic-tac-toe. “The goal is to enable her to choose her words and communicate consistently with the computer,” says speech therapist Robyn Dragonetti, who works with Maggie three times a week. All this treatment isn’t cheap. Fortunately, a state-sponsored public health insurance program in combination with Medicare and Medicaid picks up the tab for the rehab center and her medical costs. Pretty much all the rest falls to her parents (although her father is currently unable to contribute financially) and it’s a hefty burden. The $475 Maggie gets monthly from Social Security disability goes to the rehabilitation center. That amount includes $55 for clothing and toiletries, and Nancy adds another $75 so Maggie can go to the hairdresser once a month. Nancy also spends $1,000 a month for Maggie’s massages and acupuncture. In 2007, Nancy held a fundraiser to buy a van to take Maggie on outings, and raised another $10,000 to put a ramp on her home so her daughter could visit. Maintaining the van and taking Maggie on the occasional field trip run her another $4,000 a year. Without question, Worthen’s dreams for her daughter are nothing like the ones she had before the stroke. “After four years, you have to let some things go. I know Maggie won’t marry one day, won’t have children of her own. Instead, now I think about what could become possible for her.” Worthen hopes her daughter might one day be able to live in a group home, rather than an institution, and has taken part in a state lottery program that selects 100 people per year for just such an opportunity. “That would give her such a sense of normalcy—and independence. Margaret was always so independent,” Worthen adds. And she’d like to see more visitors drop by to see Maggie, something she considers essential to her ongoing improvement. In the early months and year after the stroke, friends and family visited often, but visitors have become fewer and farther between over the years. Her longtime boyfriend stopped coming a year and a half ago, telling Nancy he couldn’t bear it any longer. (Nancy, in an effort to stay positive for her daughter, has simply told Maggie that he’s busy.) Other friends have moved or become occupied with their own lives and goals. For most of her friends, dealing with residual guilt about “that day” has made seeing their old friend even harder. Even though Brown recognizes there was little she could have done to change the course of things, she says, “I still can’t help but wonder.” That’s a sentiment echoed by Megan Trank ’08, now an editor living in Brooklyn, New York, who visited Maggie several times the first few years. “There was some guilt—I know I felt it. Sometimes I still do, even though I know that there’s nothing we could have done,” she says. 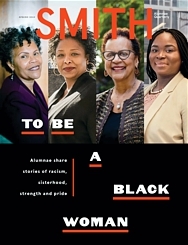 Debra Michals is a frequent contributor to the Smith Alumnae Quarterly. In addition to writing freelance, she teaches women’s and gender studies at Merrimack College.